National TLC Service representative Shiloh Krupar kicked off the agency’s 2013 Cold War museum tour with a visit to “The Hilltop,” also known as Los Alamos. Located approximately 35 miles northwest of Santa Fe, the Los Alamos National Laboratory (LANL) was established in 1943 as part of the Manhattan Project, the U.S.’s top-secret program to develop the atomic bomb. Numerous academic and more popular accounts of the laboratory exist, detailing its rise and ongoing activities. Among them are monographs that render the insular culture of the lab and town, reports on espionage and security controversies, labor histories and political-economic critiques of LANL’s mounting budget, and more. Los Alamos and the greater “bomb economy” of New Mexico have long been on the National TLC Service’s radar screen due to these citizen and scholar efforts to understand the Manhattan Project and its legacy. 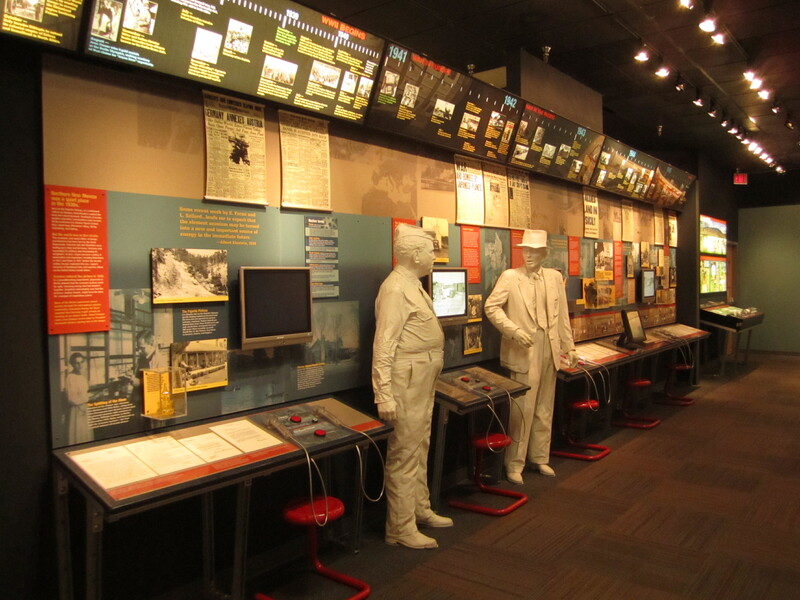 The National TLC Service selected Los Alamos as the starting point of its museum tour, however, due to the Los Alamos Bradbury Science Museum—an essential and timely entry in any critical inventory of U.S. Cold War culture. 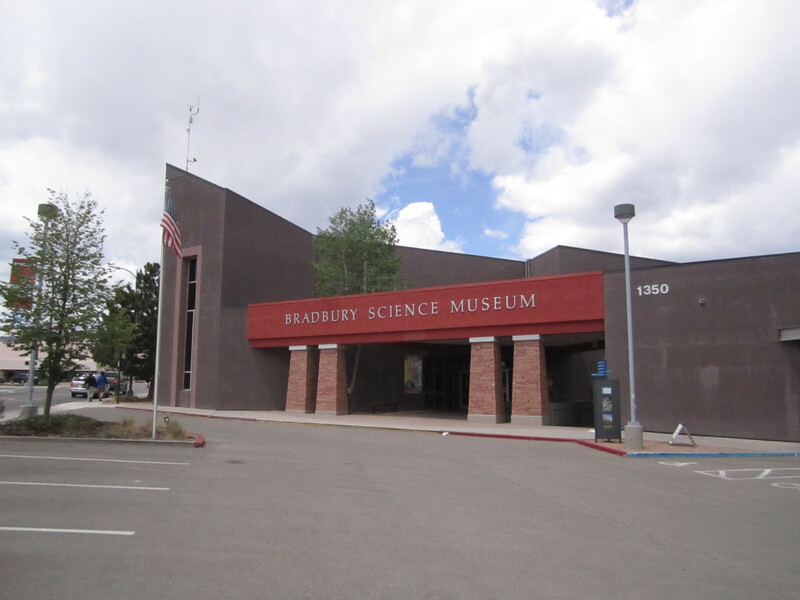 The U.S. Department of Energy’s (DOE) Bradbury Science Museum has been at the forefront of the DOE trend in establishing museums at all of its national laboratories. The Bradbury Science Museum provides its visitors with a unique opportunity to participate in DOE public relations at a critical juncture in its operations: The DOE Inspector General recently recommended to Congress (March 2013) that the agency launch an initiative patterned on the Department of Defense’s BRAC base closure program to streamline, downsize, and dispose of some of the DOE’s sixteen national laboratories, which includes LANL, Lawrence Livermore, and Sandia, among others (refer to map). 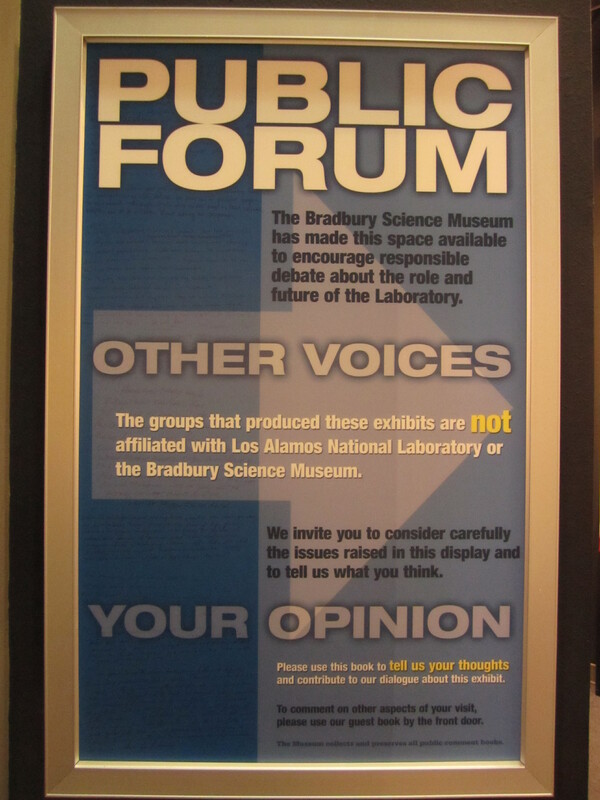 In this context of auditing and potentially reducing the multi-billion-dollar administrative overhead of the DOE’s annual budget for its national labs, the Los Alamos Bradbury Science Museum innovatively combines historical exhibitions with overt DOE laboratory mission advocacy, rationalizing LANL’s mounting $2.2 billion budget (2012)—the majority of which is spent on the nuclear weapons program—in terms of global security , non-proliferation, “science serving society,” and the care of aging nuclear materials. The National TLC Service dispatched interim co-director Krupar on May 20, 2013 to document the museum’s general hybrid function: Commemoration of the achievements of the Manhattan Project and an idealized slice of everyday life in historic Los Alamos, with maintenance of a public platform to justify the continuation of nuclear weapons research amidst calls for Cold War closure. The following are excerpts and images from Krupar’s field notes. 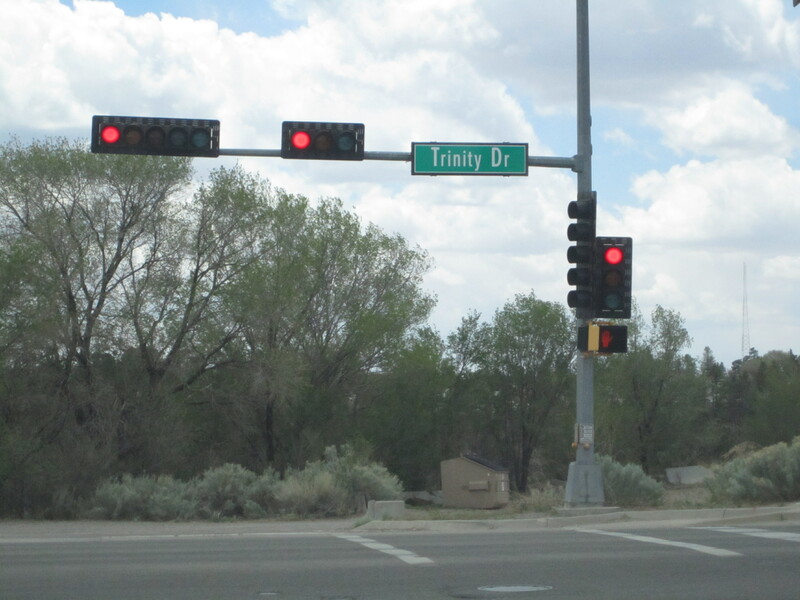 Some of the tropes that have been used over the decades to characterize DOE government towns (such as Hanford/Richland, WA or Oak Ridge, TN) continue to resonate with this DOE research hub, located on a mesa top still only accessible via a one-lane ledge road. Los Alamos remains a DOE-oriented community: Signs of the Department of Energy are visible in every nook and cranny, and the built environment exudes a worn-out but adaptively reused quality that is typical of company towns. Based on my quick car cruise around town, tourism does not appear to have moved up the ladder yet to occupy a central position in the local economy. 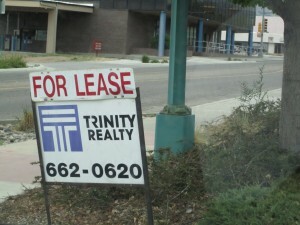 Even so, an “atomic city” theme emerged from both old remnants of the town as well as variously visible everyday practices: From historic street names like Oppenheimer and Trinity Drive to “Atomic City” transit bus routes or the Trinity Realty Company signs that marked homes for sale. While such nuclear-oriented names may seem strange to outsiders, they are common in DOE towns and are rather unremarkable to those who grew up in or are familiar with such places. I was in fact surprised that there were not more atomic cultural remains on hand to be consumed as kitsch, such as a leftover mid-century movie theater sporting atom symbols or a nostalgic tiki bar from the Manhattan Project early years. My father had referred to the commute up to the Los Alamos hilltop from Santa Fe as “the drive up the volcano,” so I had mistakenly assumed that there would be a few exotically-themed 50s-era holdovers. My jaunt around town turned up no such sites—instead, an organized system of signs marking Manhattan Project-era landmarks and several stone-encased somber plaques dedicated to citizens that have helped US war efforts and the National Historic Landmark status (since 1966) of the Los Alamos Scientific Laboratory. 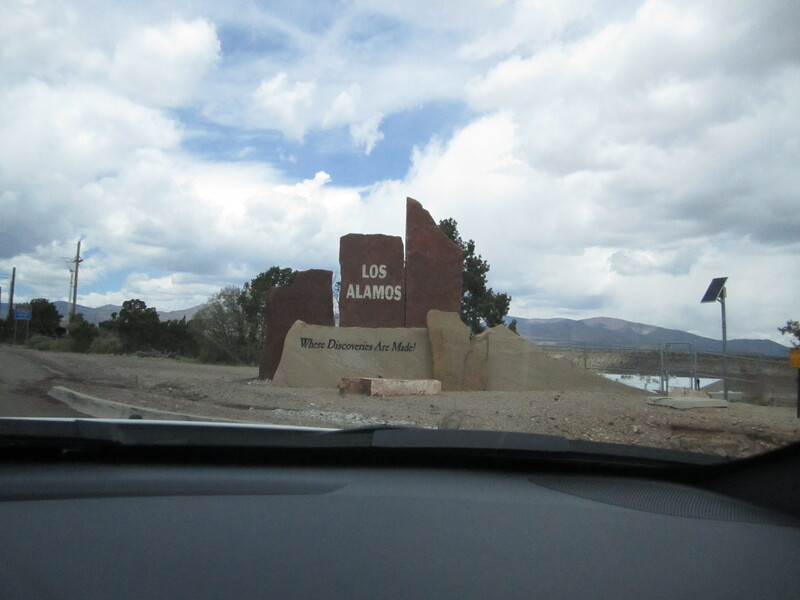 I came to realize that Los Alamos was and remains a particular kind of DOE town: A distinctive “lab town” mostly populated with scientific and technical experts. Because the lab is still in operation, the town and some of its commemorative offerings exist in an uneasy suspension between ongoing nuclear weapons work and the predominantly “post-Cold War” perspective of most Americans who engage in atomic nostalgia, tourism, and consumption. 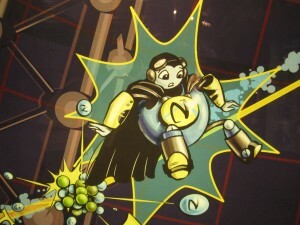 This temporal tension continued to surface throughout my entire visit, especially at the Bradbury Science Museum. The Bradbury Science Museum resides in the historic downtown area of Los Alamos. It is a hip, shed-like structure similar to new-build/loft constructions of the early zeds. Adjacent to a mostly empty strip mall of the same architectural style, where a museum store once resided, the museum projects a kid-friendly, history-oriented, and interactive science-themed image. The museum has free admission and opens its doors to the public nearly every day of the year. The parking lot serves as a meeting point for van tours of historic Los Alamos points-of-interest, and the museum hosts a lecture series and numerous events as part of LANL’s public outreach. The Bradbury also organizes travelling exhibits and “Science on Wheels” programming to local schools. Overall, this is an extremely accessible museum—an interesting contrast to the insular feel of the town, which is not easily understood by a quick visit or touristic survey of its built environment. Upon entry, I was greeted by friendly and informative volunteers, who provided museum guides (see guide) and encouraged me to view several short film offerings. I started my tour in the History Gallery, one of three main museum sections. 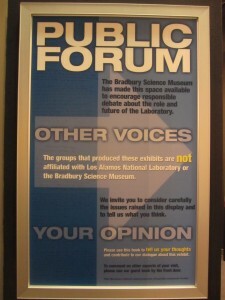 A large sign marked entry to this hall: “They Changed the World: The People of Project Y at Los Alamos.” Drawing in visitors, a large, visually well-balanced, wall-sized timeline with map insets, photos and captions of the Manhattan Project dominated the room, accompanied by framed black/white headshots and bios of former Los Alamos workers and first-hand accounts of everyday life in the secret town. While the information chronicled US war efforts, entertaining statues and scientific puzzles provided divergences from the progress narrative, such as explanations of the man-made mineral trinitite and its presence in anthills in the desert ecologies of the US Southwest (trinitite is the post-atomic blast green glass found at the Trinity test site and elsewhere in the desert blast zones). In the second exhibition area of the Bradbury Science Museum—referred to as the “Research” zone, a conglomeration of information kiosks introduced the range of projects and science/technology applications developed by LANL. Among them: LANL Technology on Mars, Space Science Research, Nanotechnology, Neutron Science, Fuels from Algae, Supercomputing, and Radiation Safety Research. Admittedly, I spent most of my time in this section playing around with a computer quiz about “Understanding Radiation” and “Radiation and Health,” in large part to document the trope of the “radioactive banana” (this figure always appears in explanations that depoliticize radiation as natural and, by association, safe) and to tinker with the old-school Mackintosh mouse that was part of the quiz technology. This section incorporated several activities for kids and a flatscreen tv that streamed LANL’s Youtube channel. The overall impression was that the lab conducts cutting-edge research in an impressive number of science and technology arenas. 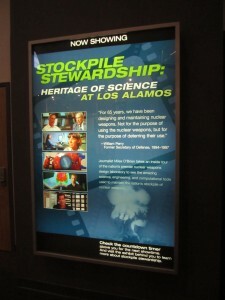 In the Defense Gallery Theater, the film “Stockpile Stewardship: Heritage of Science at Los Alamos” is repeatedly screened for museum-goers. To enter, I slipped through doors marked with radiation caution signs—but doctored to warn you not to interrupt a show-in-progress. This film captured the temporal tension that I felt in Los Alamos (the simultaneous commemoration/nostalgia yet current & elite worksite/laboratory functions) and the difficult PR task of justifying the ongoing enterprise of this premier nuclear weapons research lab. The film began with satellite imagery of the earth and voiceover that together rhetorically naturalized war. After admitting the irony in considering nuclear weapons to be a deterrent to war, the film then detailed the mission of LANL, emphasizing deterrence and the way the lab serves as a technical solution to war. 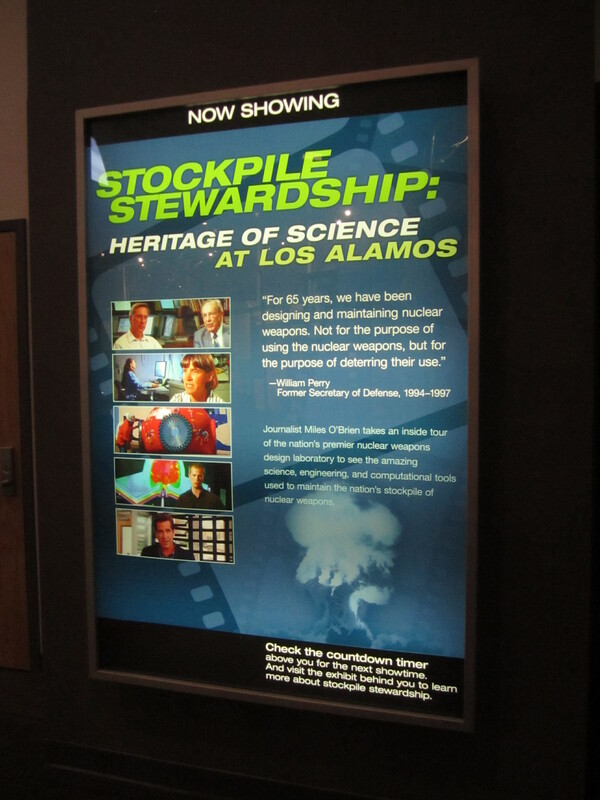 To the skeptical viewer who might be questioning whether LANL is just a job security program for nuclear physicists, the film’s narrative argued that the US must maintain nuclear scientific expertise in order to deter the use of nuclear weapons. 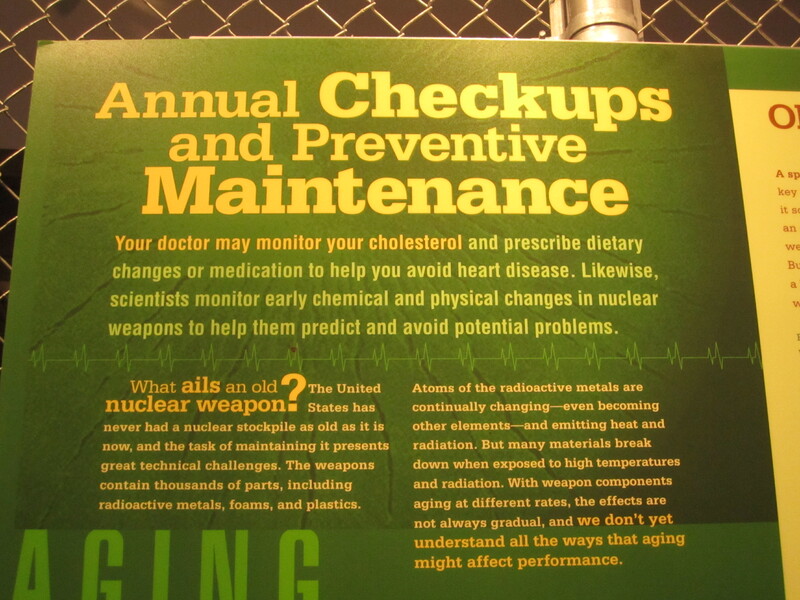 Such logic continued to circle in the film—at one point the narrator advanced that only the amazing and experienced workforce of the lab could fulfill its charge to maintain the US’s aging nuclear stockpile in the challenging environment of the ban on nuclear testing and austerity policies more generally, such as the downsizing and disposal of numerous Cold War facilities. The film stunningly reasoned that non-proliferation and the massive reduction of the U.S. nuclear arsenal—the stockpile has been reduced by 90% to levels existing under Eisenhower—require a massive amplification of expertise in nuclear weaponry. 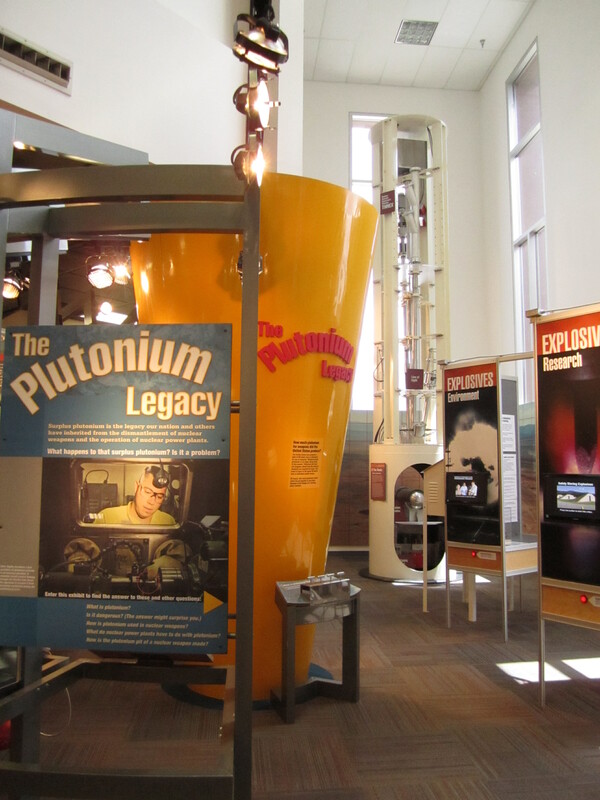 What struck me further at this point in my museum tour was the way the museum’s account of the plutonium manufacturing process failed to mention the dangers, controversies, and accidents of plutonium manufacturing centers of the past. 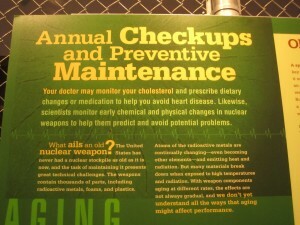 The museum was a complete void of information about occupational illness in nuclear work; there was not one mention of the nuclear worker act of 2000—the Energy Employees Occupational Illness Compensation Program Act—designed to address the bodily harm experienced by nuclear workers under the auspices of national security, safety, and secrecy to build bombs. Instead, images of clean clinical laboratory settings suggested that the manufacturing of new war plutonium pits is disembodied, scientifically-accurate, designer work—nothing akin to mass-industrial manufacturing. A display off to the side about “Safe and Secure Nuclear Weapons” compounded this disembodiment of plutonium production and nuclear work: A rolodex-type display of a limited number of accidents that have occurred in relation to nuclear weapons amazingly excluded the unknown but arguably massive number of manufacturing accidents that have occurred throughout the nationally-distributed US nuclear weapons complex. A second tension that surfaced in the Defense Gallery is the ambiguous status of the Nevada Test Site. Central to rationalizing the existence of LANL is the ingenuity of the lab in maintaining and upgrading the US nuclear stockpile without performing underground nuclear tests. Plenty of testing occurs; however, these are subcritical experiments and laboratory experiments conducted on individual components and then integrated in computer simulations. 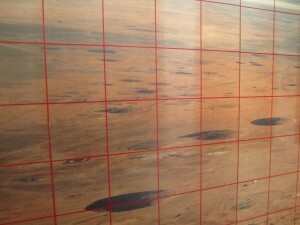 As one display explained, after the 1992 testing ban, nuclear weapons reliability, safety, and security are today determined by methods collectively called “stockpile stewardship.” Near a large wall-sized image of the Nevada Test Site pocked with craters and overlain with a red grid, a caption describes the shifting mission of the site and current testing efforts at the U1a experimental facility (app. 85 miles NW of Las Vegas in the Nevada Test Site), where scientists conduct subcritical experiments about the basic properties of plutonium and other nuclear materials to determine how aging affects them. The text carefully reminds the viewer, again, that the experiments are subcritical and do not sustain nuclear chain reactions. Ironically, there is no mention of the environmental impacts of these tests, even though we are told that one of the site’s new goals is environmental management. A confusing impression about the future of testing at the Nevada Test Site emerged in these displays, best captured in a quotation near the placard titled “Underground Testing: A Proud Past, An Uncertain Future”—“Today, the Nevada Test Site serves other uses [than testing], but it stands ready to resume its original purpose should events require the United States to test again.” If the Nevada Test Site has had to diversify its mission to include environmental issues, emergency response, and subcritical experimental testing, then it also remains on relentless standby to resume nuclear testing. 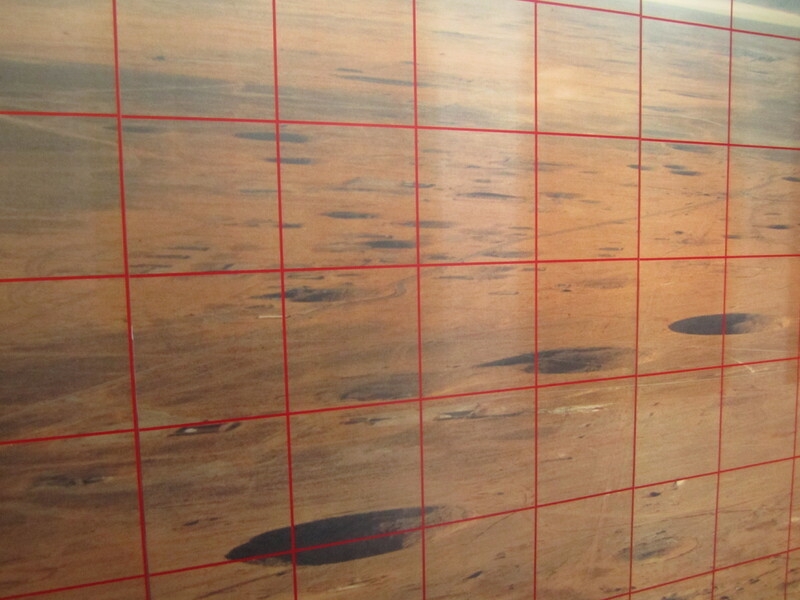 The museum’s description of the Nevada desert landscape as a Mars-like terrain made the relentless standby and sacrifice of this zone appear to make good sense for Defense. Environmental Curiosities & Public Forum Corners: Opportunities for National TLC Dialogue? The wall posters articulated further divergences of opinion. On the left, two anti-war posters relied on different rhetorical approaches: The first utilized scholarly arguments combined with historic photos to substantiate that “A-bombs were not needed to end the war quickly,” while the second poster, sponsored by the Los Alamos Peace Project, quoted the Nuclear Non-proliferation Treaty of 1970 as the foundation for a series of demands to be recommended by the citizens of New Mexico, such as cleaning up nuclear contamination and “transforming laboratories that create weapons of mass destruction into institutions that engage only in life-affirming research and development.” In massive counterpoint, a wall-sized poster larger than the other two combined stood on the right broadcasting the rhetorical question, “Why the Bomb?” The answer: “Atom Bomb Saved Civilian and Military Lives.” This contribution from the Los Alamos Education Group interestingly combined techniques of historical documentary—archival photos and captions with a museum-quality authoritative voice—with memorializing functions: “We mourn the lives lost and celebrate the lives of those who survived because of the decision to use the atomic bomb to end the war.” The National TLC Service endeavors to organize participatory charrettes to engage with such rhetorical stances, debates, and creative forms of engagement in Cold War memory and culture. We will be providing further information about our charrette process in the coming months. 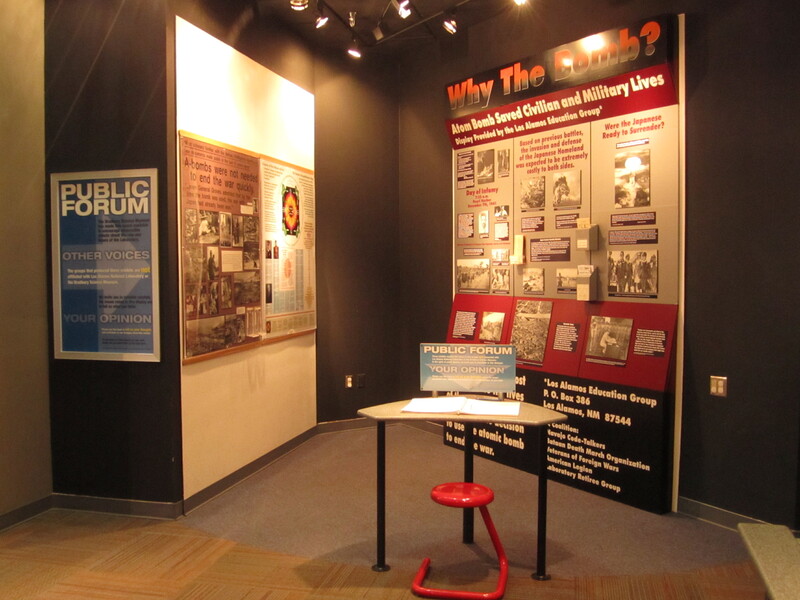 The National TLC Service will continue to catalog Cold War-related exhibition spaces, as per its founding Act and active mission; further museum profiles and highlights will be added in the coming weeks.